According to Salary.com, the median national wage for a forklift driver is $32,768. For an operator with forklift certification in El Paso, Texas, this is $28,050. Well, one of the nice things about having El Paso forklift certification is the ability to pack up and move wherever you like, knowing that wherever you go in the United States, you should have little or no trouble finding a job. The cost of living in El Paso is generally less than the national average, so you’ll likely have just as much spending money as forklift drivers in other parts of the country. 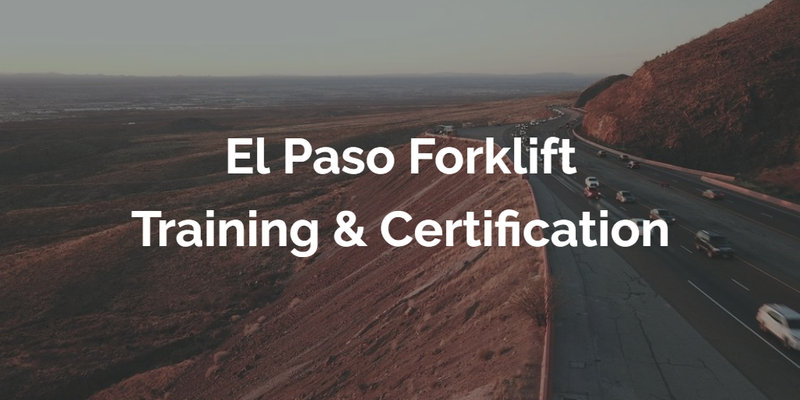 With OSHA approved training from CertifyMe.net, the leader in online forklift certification, you’ll enjoy enhanced job opportunities in El Paso. The city’s strong, growing economy is home to many large corporations, and is also a major transportation hub for between West Texas and other areas in the U.S. Midwest, Rocky Mountain region and west coast. The city’s strategic location also makes it an international transportation center, with Mexico just to the south. Western Refining and other companies ensure that forklift drivers will continue to be in demand. El Paso’s economy features robust economic activity in mining, energy, natural resources, distribution, and many other sectors. With OSHA training from CertifyMe.net, you’ll have the best possible chance to get a great paying forklift job in El Paso, TX. If you are considering getting forklift certification in El Paso, don’t let the median salary figure freak you out. Compared with San Diego, where the median salary for a forklift operator is $34,767, bear in mind rents are a lot higher there, too. The rent index in El Paso is 24.77, while the same in San Diego is 54.21. While detailed figures for a full quality of life comparison between the two cities are not available, El Paso is a safer place to live than San Diego. This can be an important consideration if you have forklift certification in El Paso and a family with children. Getting El Paso forklift training has a lot going for it. Far from the bright lights and noise of the bit cities, San Antonio and Dallas and situated on the Mexican border, El Paso is a perfect melting pot of American and Mexican cultures. You are also more likely to get an authentic Mexican meal here than in more eastern parts of the state of Texas. From authentic cuisine to outstanding forklift job opportunities, El Paso, TX has a little bit of everything. And CertifyMe.net has the complete, comprehensive OSHA forklift training you need to obtain all kinds of forklift jobs in El Paso. Among the top ten employers for individuals with forklift training in El Paso are the City of El Paso, the El Paso, Socorro and Ysleta independent school districts, Fort Bliss, Walmart and the University of Texas. All of these types of employers employ staff with forklift training El Paso. Airports are also heavy users of workers who have forklift training and El Paso International Airport is no exception. In 2010, the airport served more than three million international passengers. El Paso has earned itself the nickname Sun City for its hot, desert climate, where the sun shines an average of 83 percent of the daylight hours 302 days a year. 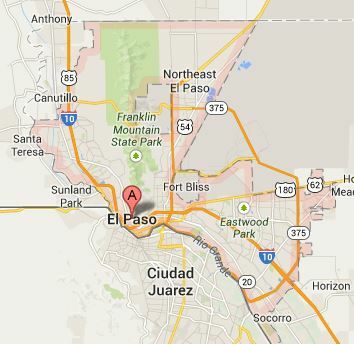 At an elevation of 3,800 feet, it El Paso is capable of producing snow in the winter. On the days when you are not earning your wages putting your forklift training El Paso to productive use, you can nip across the border and explore Juarez. There is plenty to do locally in El Paso. Franklin Mountain State Park celebrates the mighty Franklin range. The summit of North Franklin peak rises to more than 7 thousand feet above sea level, approximately 3,000 above El Paso itself. There are two hiking trails and primitive camping facilities. El Paso has loads of annual cultural events, from the Amigo Airsho, one of the top ten air shows in the country, to Music Under the Stars, a series of outdoor concerts that runs from June through August. Every Memorial Day weekend, the skies fill up with more than sixty hot air balloons taking part in the KLAQ Balloonfest. There are also many other great nearby cities to get your forklift operators card. Learn more about Texas forklift certification. Get El Paso Forklift Training with CertifyMe.net! CertifyMe.net offers three different training packages, all designed to offer full OSHA compliance, a full understanding of safety regulations, and promote a safer, more productive work environment. Rough Terrain Forklifts – looking for an outdoor forklift job in El Paso? This course is for you. All CertifyMe.net courses are available in English and Spanish, which is big advantage in El Paso. Visit our pricing page to learn more about our forklift training courses. Thanks for considering CertifyMe.net for your El Paso forklift training needs!